There are many reasons which explain why a business wants to get more from their profits. The country which a business has an account in might charge a very high rate of tax. In the United Kingdom, companies have to pay a 50% tax rate when profits exceed £150,000. However, businesses in France have to pay a staggering 75% rate of tax when profits are more than one million euros (£800,000). There is a solution to the predicament which many companies are facing because offshore banking can help. When profits are made in a country which a business has an offshore account in, they are only liable for the rate of tax which is applicable there. For example, a British company which has an offshore account does not have to pay the rate of tax which HMRC (Her Majesty’s Revenue and Customs) sets for businesses. If a French company doesn’t want to pay a high rate of tax, a lower rate than the aforementioned which is applicable when it earns more than one million euros will have to be paid when they have an offshore account. How much tax will a company have to pay for profits that are made in an offshore account? The rate of tax in each country differs from one to another. There are a considerable number of countries around the world that do not charge a high tax rate. In fact, it can be 20% or much lower. Barbados is one such country because International Business Communities (IBC’s) only pay a tax rate of 1% to 2.5% for profits which are made there. However, many countries around the world do not charge any tax at all and are otherwise known as tax havens. 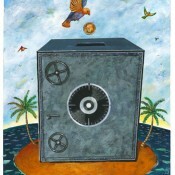 There are many tax havens in the Caribbean. Anguilla and the Bahamas are examples of such but other tax havens exist. Monaco, Switzerland and Andorra are regarded as tax havens where a considerable amount of money can be made in those countries and companies never have to pay any tax. If a business wishes to have an offshore account in a country which charges a lower rate of tax, they should seek assistance from a professional who has helped many companies before to do so. This is because it can be very complex to register an offshore account and you might not know about the local laws which apply to companies who want to have one. However, as such professionals have helped many companies to have an offshore account, the assistance which they provide will be very beneficial. When a business wants to have an offshore account so that they can pay a lower rate of tax or none at all, there are many countries which enable it to do so. This article was brought to you by offshore.a1companies. We specialize in setting up your offshore company and providing an entire solution when you want to move your company abroad.